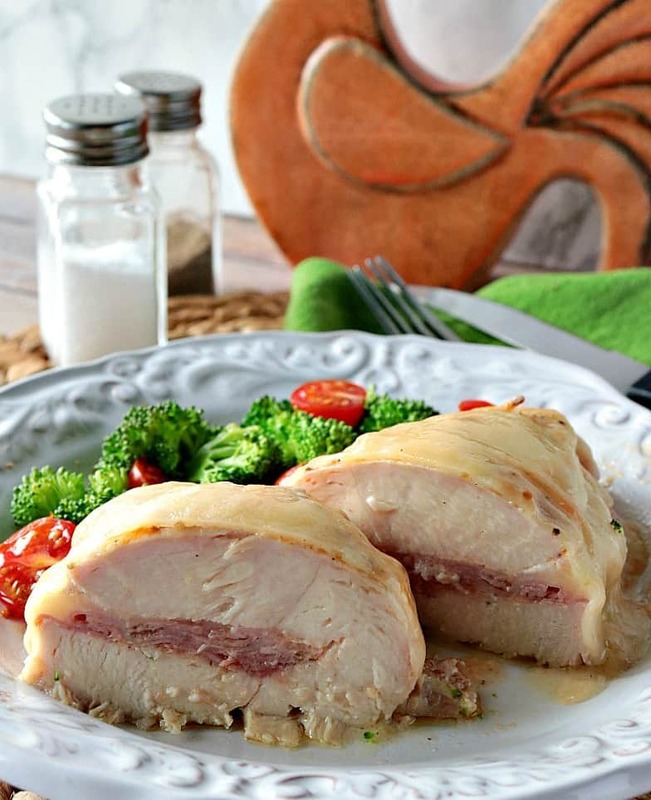 Gluten-Free Chicken Cordon Bleu, Kudos Kitchen Style is a tender chicken breast stuffed with ham, Swiss cheese, and a kicky horseradish mayo sauce for extra flavor and pizzaz! 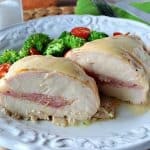 Gluten-Free Chicken Cordon Bleu, Kudos Kitchen Style is a relatively easy dinner to get on the family dinner table. The only small trick you’ll need to learn (if you don’t already know how) is to butterfly a chicken breast so the sauce and filling can be added. But, don’t fret if you’ve never butterflied a chicken breast before. I’ll walk you through the process with my easy to follow step-by-step photo tutorial! You got this!! **Please Note – The printable recipe card with detailed instructions and complete ingredient measurements for making Gluten-Free Chicken Cordon Bleu is available near the end of this post. Lay the breast on a cutting board and place one hand firmly on top of the chicken. 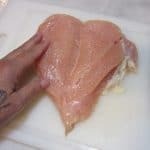 With a sharp carving or chef’s knife, carefully slice into the breast vertically, making sure to gently ease the chicken breast open as the cut gets deeper. The hand on top of the chicken is meant to guide you so the slice stays in the center of the breast. Keep your knife as evenly horizontal as possible and use nice even strokes to slice through the meat. Make sure NOT to slice completely through the breast. The object is to slice open the breast so it resembles an open book. Once the chicken breast is butterflied, you can fill it with your ingredients. Slather the inside of the butterflied chicken breast with the horseradish mayo sauce. Lay ham slices and Swiss cheese slices on one side of the butterflied chicken breast. Fold the other side of the breast over the ham and cheese and slather with more horseradish mayo sauce. Tie the chicken cordon bleu breast securely with kitchen twine, or close with toothpicks. Place the chicken cordon bleu breasts on a baking sheet and bake in a preheated oven for 40-45 minutes, or until the chicken juices run clear when pierced or when the temperature reaches 160-degrees on a meat thermometer. Remove the chicken cordon bleu from the oven and top the breasts with additional slices of Swiss cheese. Return the chicken back into the oven for an additional 7-10 minutes. Remove the chicken from the oven and allow to sit for 5 minutes before serving. Remove the kitchen twine or toothpicks before eating. 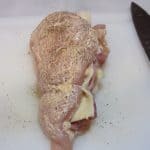 What are some side dishes and/or desserts that would go nicely with this recipe for gluten-free chicken cordon bleu? Below is the printable recipe card for today’s Gluten-Free Chicken Cordon Bleu. If you’ve enjoyed this recipe, I’d appreciate if you’d take a moment to give this it some feedback by way of stars near the comment section at the end of this post. Thank you. 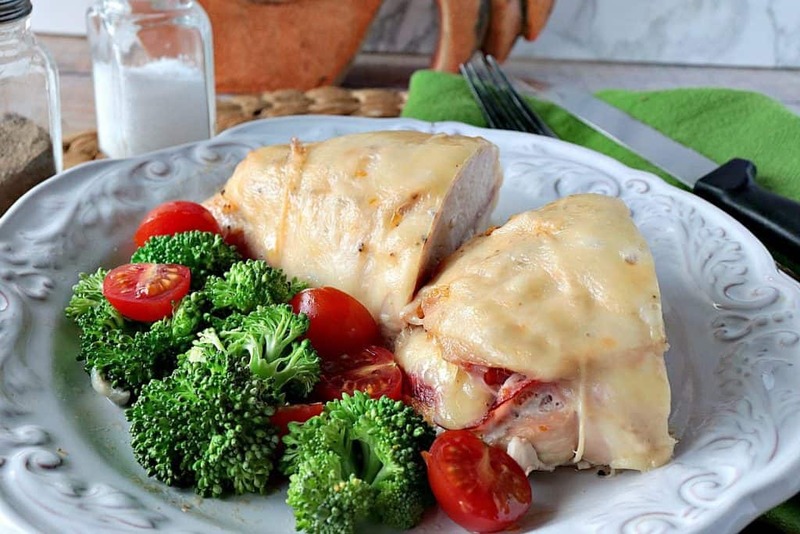 Gluten-Free Chicken Cordon Bleu Kudos Kitchen Style is a tender chicken breast stuffed with ham, Swiss cheese, and a kicky horseradish mayo sauce for extra flavor and pizzaz! In a medium bowl, whisk the sauce ingredients together. Set aside. Carefully butterfly the chicken breasts and open it like a book. Brush or spoon the inside of each butterflied chicken breast with the prepared horseradish mayonnaise sauce, reserving some sauce for topping. Season the inside of each chicken breast with salt and pepper. 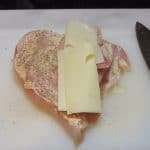 Divide and place the ham slices and some of the Swiss cheese on half of each butterflied chicken breast, making sure to reserve cheese slices for topping the cordon bleu. 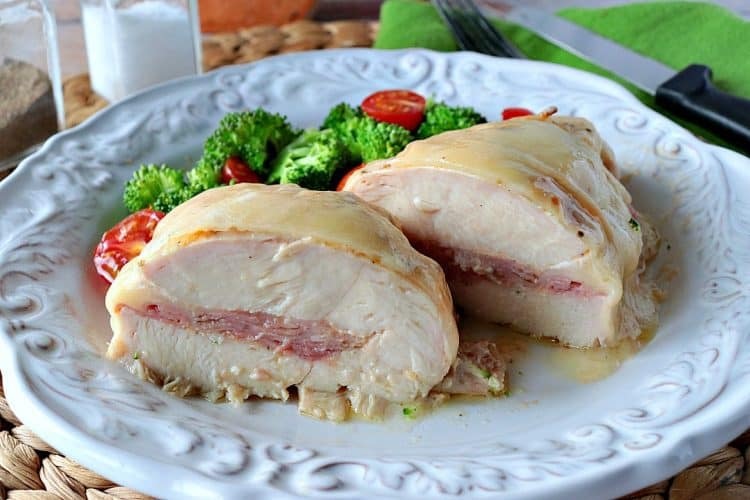 Fold the empty half of the chicken breast up and over the ham and cheese stuffed half. Use kitchen twine or toothpicks to close the cordon blue to keep the filling from falling out in the oven. Spoon or brush the remaining horseradish mayo sauce over each chicken cordon bleu and place the chicken breasts onto a baking sheet. Bake in a preheated oven for 40-45 minutes, or until the chicken juices run clear, or the temperature of the chicken is 160-degrees using a meat thermometer. Remove the chicken cordon bleu from the oven and top each breast with the remaining Swiss cheese. 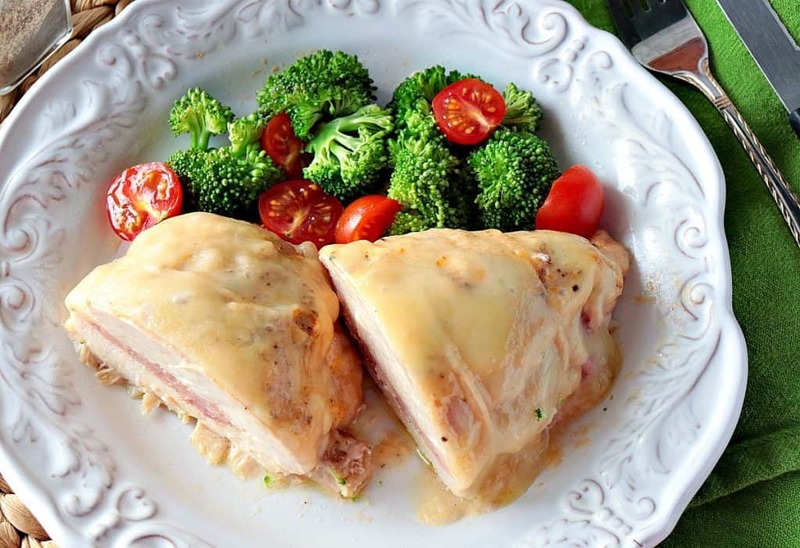 Return the chicken cordon bleu to the oven for an additional 7-10 minutes to brown and melt the cheese. Remove the chicken from the oven and allow to cool for 5 minutes. When ready to serve, remove the toothpicks or kitchen twine. baking sheet, chef's knife or carving knife, medium bowl, whisk, spoons, kitchen twine or toothpicks. I sincerely hope you’ve enjoyed today’s recipe for Gluten-Free Chicken Cordon Bleu, Kudos Kitchen Style as much as I’ve enjoyed bringing it to you! This is one of my favorite recipes from back in the day, love it! Such a tasty comfort food classic! Love that it’s GF — WOOT! Thanks, Jenn. Glad you like this Gluten-Free Chicken Cordon Bleu recipe. I hope you enjoy it! I love finding amazing gluten free recipes and this one did not disappoint! So delicious and easy to make! Yum! So glad you like this recipe, Meagen! Thank you! Such a fun recipe for a dinner party or special occasions when you want to do something a little fancier! Thanks for sharing the recipe! Thank you, Liz. You’re right! This would be a nice entree for a dinner party or special occasion. I love those flavors together! They’re classic, and the horseradish mayonnaise add just the right kick! This sounds amazing for dinner! I like the gluten-free twist! Ah, a blast from the past! I can’t wait to revisit this old fave!